NEW YORK, Nov. 15, 2018 — (PRNewswire) — Shutterstock, Inc. (NYSE: SSTK), a leading global technology company offering high-quality assets, tools and services through its creative platform, today announced a new content integration within Final Cut Pro X. 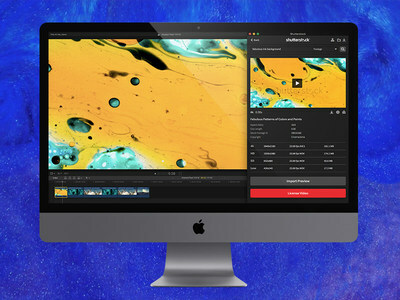 The Shutterstock extension is the only stock footage extension to be integrated with the release of Final Cut Pro X, offering more than 250 million video, image, and music assets available for license. This custom-built extension is the first multi-asset API tool Shutterstock has launched. Shutterstock designed the extension to streamline the video creation process by equipping filmmakers with the ability to browse, preview and purchase Shutterstock's full collection of video, image, and music assets from within the Final Cut Pro X interface. Additionally, Shutterstock is providing Final Cut Pro X users with free access to hundreds of assets in twelve professionally-curated collections that can be downloaded and used in any project at no cost. "We are constantly working to bring efficiency to the creative workflow process and this extension is one way we are delivering this for video professionals, helping them craft their story and realize their vision," said Jon Oringer, founder and CEO of Shutterstock. "As a leading post-production platform and video editing application, Final Cut Pro X is the ideal app for this multi-asset extension as it delivers powerful tools and sleek interfaces to a global community of professional filmmakers and editors." The Shutterstock extension for Final Cut Pro X is available on the Mac App Store today. For more information on Final Cut Pro X, click here. Financial data for Shutterstock, Inc.